Jitterbug was born 28 January 1998. 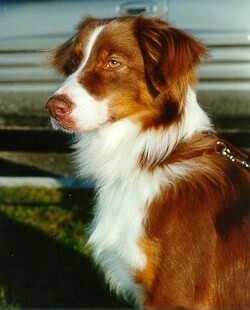 She is a Canadian Kennel Club certified Australian Shepherd who was rescued from a shelter in Ottawa. We adopted Jitterbug on 16 December 2000. When she came to us she was about 35 pounds, and about 19" tall. 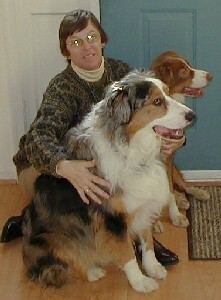 Here are Jitterbug and Tucker together, with Nancy.